Hi friend's,I found this trick something useful while i am on twitter searching for new profiles to follow.But "Please Don't Use These Method For Spamming Other's Or Any Other Related"
Well, this isn’t exactly a hack, but nevertheless lets you reap a load of valid email Id’s off Twitter. If you’re a spammer / email marketer you may know what that means. Typically, people who’re concerned about privacy would not publish their email ids on twitter. But there are many who does. I assume they’d like some attention, which is why the ids are published on their profiles. However, if you go to Twitter people search and do a simple search on “gmail.com” (See Example Here), you’ll get a boat load of email IDs. Now, is this a security issue ? Not really. 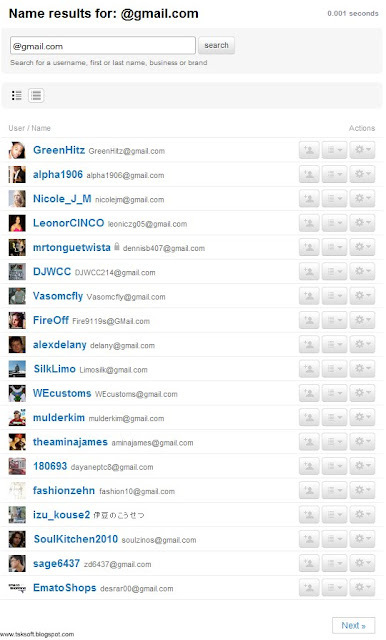 Because these folks voluntarily published their email IDs on their profiles. But as long as these are valid ID’s, this is a gold mine for email marketers..err I mean spammers ! And Finally,I Think This Article Helps You A Lot And My Dear Loyal Reader's And Friends After Some Days,I Will Post A Article On "How To Extract Your Twitter Follower's List"(Just Only Twitter User name And First Name,Last Name And Other Related).Since Twitter Will Not Allow For Extracting Email Id's Of Your Follower's.So,Please Visit The Site Again For Regular Updates.